While rounding a bend in the Okavango Delta, our open-air safari truck’s path was suddenly blocked by a wall of two hundred massive gray rocks, otherwise known as elephants. After the initial flurry of photos, we began crossing the channel where the elephants were lined up for a drink. Wise Guy, driver of the first vehicle, cautiously moved forward with his band of seven guests as our group of eight trundled behind in the second land rover. Along our slow crawl the elephants trumpeted, flapped their ears, and stamped their big-boy feet threatening to T-bone us as we forged the river. Wise Guy stopped mid-stream leaving us facing an enormous matriarch furious at us for being too close to her baby. Finally, Wise Guy surged forward as the blasting trumpets of the herd followed. Hearts were pounding as we navigated the gauntlet of normally docile creatures shuffling and snuffling in the water. This was one of many exciting wildlife encounters experienced on our 17-day Ultimate Safari with Overseas Adventure Travel that took us from Botswana to Zambia and Zimbabwe. We stayed three nights in each of four bush camps established in the largest wildlife preserves in Africa. Each camp is set in its own unique micro-climate. They are similar in that the main lodge with it thatched roof, teak wood floors, and open beams serves as meeting place and dining hall where delicious buffet meals are served. Screened tent homes with amenities including private baths and electricity provide glamping at its best. 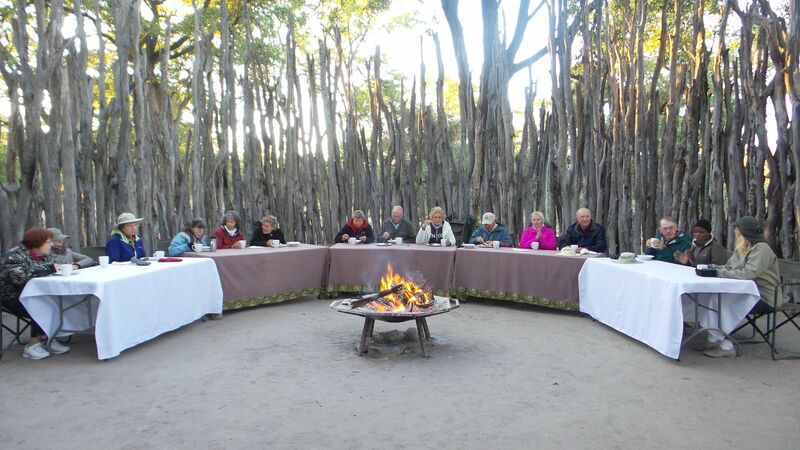 Guests are greeted with dancing and drumming, and the three-night stay at each camp ends with a traditional ceremony around the fire in the boma. Hosts are gracious, extending, and eager to please. Influence of past British rule is seen in formal table settings, and high tea is at 3 PM each day. In Botswana we saw giraffes splashing in the Chobe River with a herd of elephant grazing on an island in the background. A tender blue sky with powder-white clouds framed the river that fanned out in a wide estuary. There is no industry save for diamond mining in Botswana, so the world is the way it supposed to be. What a treasure. Large herds of Cape buffalo, famous for their nasty disposition, stared at as we lumbered by. A turn up a dusty road through tall golden grasses revealed a dazzle of zebra and a herd of impala, the fast food of the savannah, grazing peacefully. 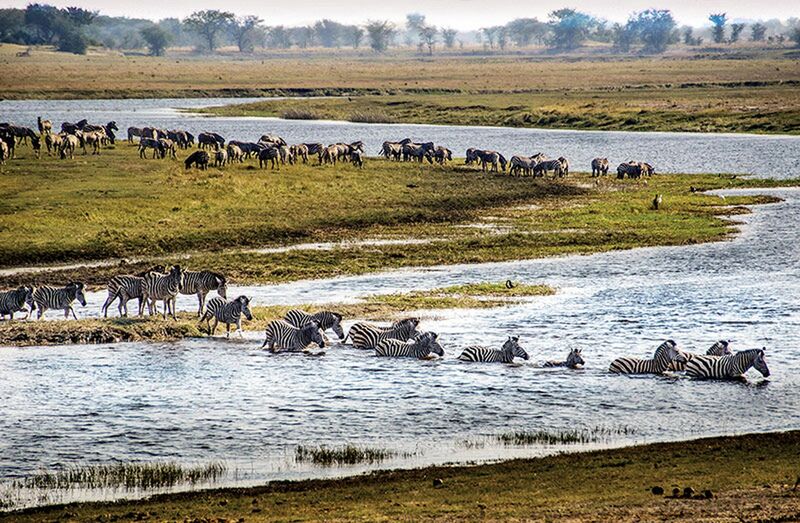 Game drives in the Okavango Delta’s mosaic of grass and reed-lined river channels and mopane woodland garnered sightings of rare birds like the saddle-billed stork, grey-crowned crane, and the ubiquitous hornbill lifting at our approach. 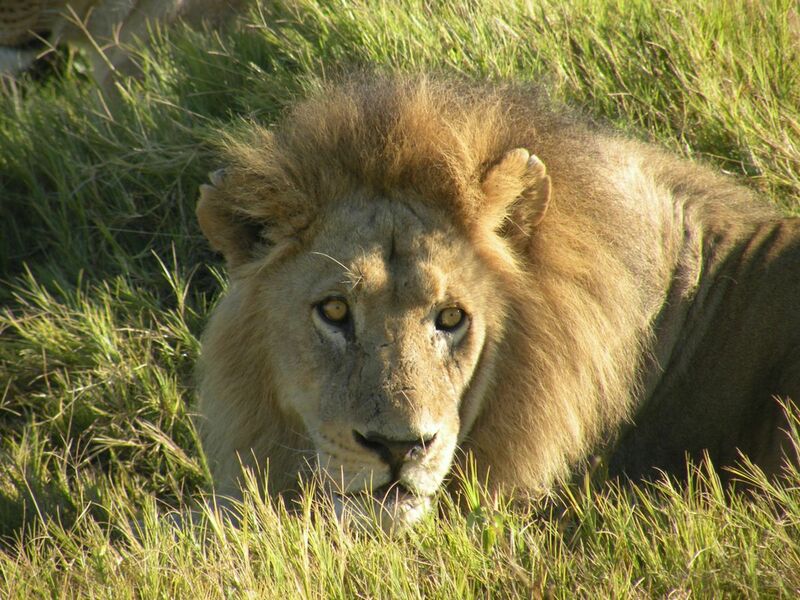 We tracked a pride of five lion in the Delta to where they were resting after a night of hunting. A special treat was a glide through the waterways in a mokoro, a dug-out canoe used by local tribes for transport when the waters rise over the maze of sand tracks in the park. In Zambia our luxurious tent homes overlooked the Lafupa River. During an afternoon siesta a platoon of curious vervet monkeys eyed me through the screened windows. To the delight of the birdwatchers in our group, we spent an entire day on the river. Thick water berry trees with roots much like the mangrove hug the shoreline where crocs and hippos rest in the shade. Bubbles told us hippos were submerged within feet of us. Round ears and flared nostrils were all that we could see on the surface. Hippos stay cool during the day by walking the river bottom, and then broach the shore to graze all night. At our fourth camp In Hwange, Zimbabwe’s largest park founded in 1928, my tent house set high on a plateau overlooking an expanse of basalt mopane woodland. Vast herds of elephant, buffalo, zebra, and large predators like lion and cheetah roam freely here. Birds chirped sweetly as I surveyed the rugged landscape resulting from volcanic action millions of years ago. May is winter in Hwange, but it feels and looks like fall with its golden leaves and champagne-colored grasses. On our morning drive we passed the usual flocks of Guinea fowl whose peacock colored heads signify that they have reached “self- esteem.” It was not long before we had a hallelujah moment as a bold cheetah casually strolled through a dry patch to a shady tree where he sprawled to rest. He rolled over and looked at us over his shoulder letting us see his tear drop markings clearly. Around the next bend by the rhino boma, we ran into mating warthogs—a sight to behold! Black rhinos reintroduced in Hwange are known to run themselves to death if care is not taken in their adjustment. The park closes at 6 p.m. when armed rangers begin patrolling to protect against poachers. Our last stop was Victoria Falls, the largest curtain of water in the world. It is a wild and untamable torrent that charges through a deep gorge sending spray 1,500 feet into the air. The mist from the falls nourishes a rain forest of tropical foliage that seems out of place in this mostly arid region. A path tracing the gorge takes one to Dangerous Point where a deluge drenches the undaunted tourist. I lunched on crocodile salad on the terrace of the Victoria Falls Hotel overlooking the falls where heads of nations come to relax in a remnant of colonial splendor. One can see the smoke and hear the thunder of the falls in the distance and give homage to a body of water that knows no master.